Swamplandia! by Karen Russell is about a family struggling to keep their business and each other together after their mother passes away. 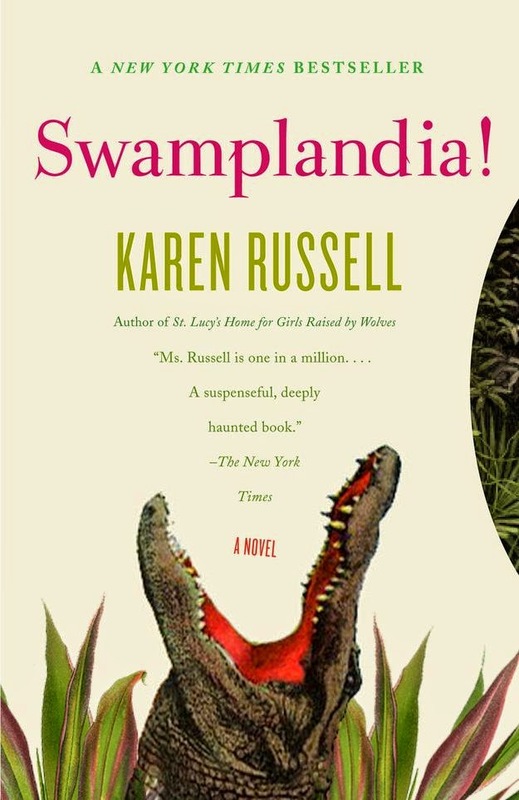 The twist is that mom was the star attraction at Swamplandia! a daring alligator wrestling show on a small island off the Florida coast. Top off their grief and financial famine with some major competition on the mainland and their fight seems to pull them down to an alligator death roll. I love this book! It was binge-worthy—difficult for me to set down. The author entangles a smart and sophisticated writing style with bright, witty characters in a unique setting with an original plot. The 13-year-old narrator, Ava, drew me into their world of swimming with and wrestling alligators in a washed-up tourist trap where she’s hoping to fill her mother’s shoes. In the meanwhile her sister is obsessed with ghosts, while her brother joins enemy forces, and the father leaves them to try and save it all. This book was quirky and fun, and while one disturbing part burst my bubble of joy, other bubbles buoyed this book way up. I thought it was a delicious treat that I think most readers would like to sink their teeth into. This book met one of the 2015 Book Challenges: Read a book set on an island.